Sometimes, we are all this blob—a large, gelatinous mound sitting in a lake, begging to be left alone. Recently, one such blob was found near the Lost Lagoon in Stanley Park, Vancouver. While it might not look like something from Earth, the Blob is very much alive—and it contains multitudes. According to the Vancouver Courier, the Stanley Park Ecology Society found the alien-looking lumps—which are actually colonies of tiny marine invertebrates called Pectinatella magnifica—in the pond back in mid-August. Upon further inspection, the team found the pond was actually rife with these weirdos. Pectinatella magnifica are members of the phylum Bryozoa, which dates back roughly 500 million years. Here’s how the Blob forms: one tiny Pectinella magnifica will reproduce asexually, and the process will keep repeating itself until there’s an entire colony. Since Pectinella magnifica are kind of gross and no one wants to be their friend, they have to make their own. 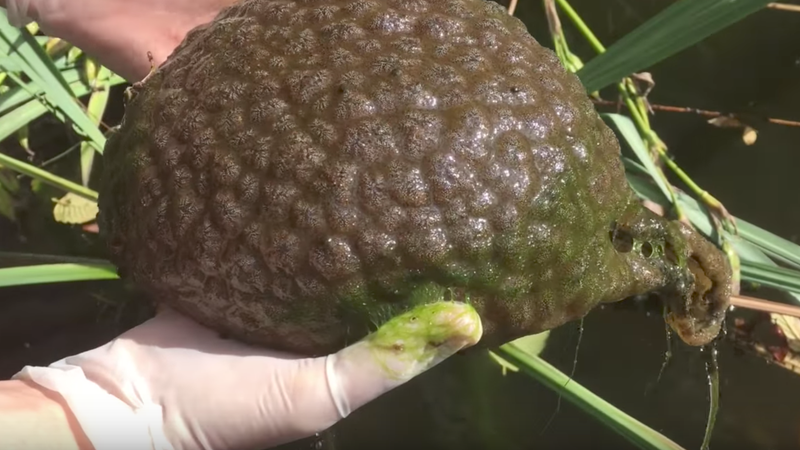 Sure, this living fossil of a Blob may not be a puppy. Still, it plays an important role in its ecosystem and we should all respect it. From afar.